Talk about jumping in with both feet! I had seen an article in the local newspaper about the annual gingerbread house competiton that takes place at the Festival of Trees event in Grande Prairie every winter. It is a major fundraiser for the QEII Foundation. I was completely inspired and vowed to join the Festival the following year. But I seem to have been bitten by some kind of bug and needed to try my hand at it immediately. I had plans to do a simple house but I was quick to realize just a house would not be enough for the creative fix I was looking for. I need to build something to go along with it. Seeing that we are in oil country a service rig seemed like a natural choice. 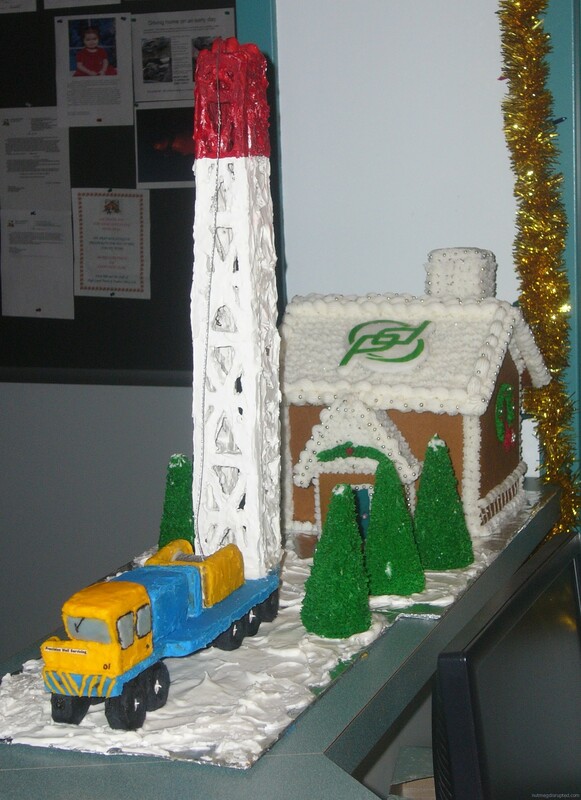 It sat in the main lobby at the Precision offices in Grande Prairie. They were not only impressed but quite thrilled with what I had put together. I was completely and totally spoiled by the boss which took me by surprise. Though it was appreciated! I was just glad they liked it And made me excited for the Festival next winter. If I could create this my first time playing with gingerbread just imagine what other cool things I could design. I had yet to discover marshmallow fondant so the complete rig is iced with royal icing. The door of the house, any yellow windows and the Precision logo were cut from fruit roll ups. Just looking the flimsey foil covered cardboard the rig is sitting on makes my stomach go into knots and my heart race a little bit. How I ever transported it like that? It is a miracle it made it there intact. Little did I know that winter what a passion playing with gingerbread would become. It truly is a honor to be able to raise hundreds of dollars with my builds. And I am so thankful I can share the pictures with you. I make the houses to share with others. Perhaps bring a little joy and to maybe even inspire! Previous Post - Previous post: John Deere feeding the hungry.